What a week for CFL football. Comebacks, blowouts, and unlikely winners are what makes the league what it is. With a minute and 40 seconds left in Thursday’s game the Montreal Alouettes scored a touchdown to give them a 40-28 lead over the Winnipeg Blue Bombers. You would think that is a sizeable lead, but the Bombers had other plans. They marched down the field and capped off the drive with a 4-yard TD reception and an extra point with 44 seconds left. That was apparently just enough time for a successful on-side kick and another quick drive, finishing with Andrew Harris punching in a 1-yard TD run to complete the seemingly impossible 12-point comeback with less than a minute remaining to win the game. The win improves the Bombers record to 3-2 while the Alouettes fell to 2-4. On Friday Edmonton kept their perfect season going with a well fought win over the BC Lions. The score was 23-20 for the Eskimos going into the final quarter. Two 1-yard TD runs from Mike Reilly would seal the deal for Edmonton taking them to 5-0 on the season with a 37-26 victory over the Lions. Saturday made for a spectacular double header, starting with a hot one in Regina. The temperature on field during the game was over 40 degrees Celsius. The only thing hotter than the field in Regina was the hands of Duron Carter. The Riders receiver made what could be the catch of the year for a touchdown making a onehanded, backhand stab overtop of the defender. 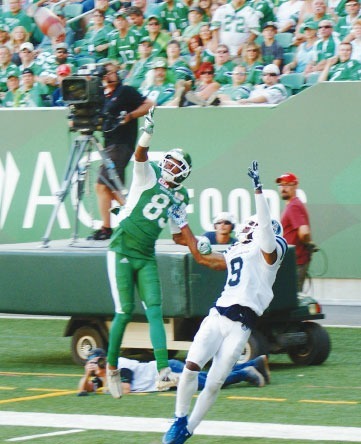 The Riders rallied over the hot hands of their receiver and were able to keep Ricky Ray and the Toronto Argonaut offence cool. Saskatchewan scored 18 points in the fourth quarter to finish with a 38-27 win. The second game of the double-header was a laugher, one of the biggest point margins in CFL history, the third largest to be exact. The Calgary Stampeders trampled the Hamilton Tiger-Cats by a score of 60-1, with Hamilton’s lonely point coming from a 53-yard punt single in the second quarter. My picks are now 14-9-1 on the season after a 3-1 week. For week seven my picks to win are Calgary, Ottawa, Edmonton and Saskatchewan. Banana Boat Sunscreen The Cause To Blistering Infants?